PRODUCT DESCRIPTION: Liquid that is mixed with water and can be sprayed over flowers and ground cover without hurting the plants you want to keep. However, it will target and kill anything growing which is a grass. It even works on creeping fescue or Bermuda grass and can be used in flower beds where your lawn is moving in and taking over. 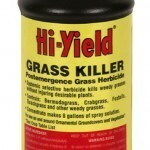 WHERE TO USE IT: Though it can be used anywhere you want to kill grassy type plant growth, the real strength and the reason most people use this product is for treating flower beds and ground cover. RATE OF APPLICATION: Use 1 oz in one gallon of water for every 1000 sq/ft of turf or plant growth targeted.